Beautiful Golf Community With Great Amenties! 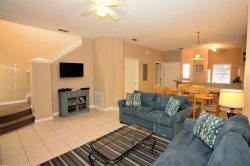 The kitchen has been equipped with everything that you could need to provide a family feast to enjoy together either at the dining area off the main family room, at the dining nook in the living room or out by the pool. Luxurious sleeping accommodation awaits you when you stay at Churchill Villa with 2 King Bedrooms, one with an ensuite, and 2 rooms each with two twin beds. There is even a queen sleeper sofa, for when your group needs a few extra spots to lay their heads! Highlands Reserve is a beautiful community off highway 27 and Sand Mine Road approximately 10 miles from Disney. There is a shopping center with a grocery store and many tasty restaurants within 5 minutes, and another power center with many big many department stores 10 minutes away. Highlands Reserve is a quiet, peaceful community with a beautiful Golf course and a community pool and playground. The team members i spoke to were all so friendly and nice at all times even on an after hours call. We loved our stay. We were a family of four plus my parents and everyone was confortable. With a living room and sitting area and 2 dining areas it gave us a chance to be together but yet have our seperate spaces at times. The house we stayed in had everything we could possibily need. It was beautifully decorated. They were very friendly and always accessible. Angela was awesome and prompt about calling back when making the reservations. Enjoyed our stay. Whenever we visit Florida we will use Paradise Properties.